Generally the soil in Toronto is of poor quality for growing crops and will require as much nourishment as possible before farming. Start by nourishing with green manure: planting alfalfa and comfrey in the spring, and tilling it back into the land at the end of the growing season. The deep roots of these plants will draw nutrients up from deeper soil, producing much higher quality soil the following spring for growing good-quality crops. After a year of preparing soil with this green manure or by mulching (see below), test the soil type for pH balance and adjust with additives and natural fertilizer when available. Fertile soil requires 3 things: a healthy ratio of silt, clay, sand and organic matter; a pH balance of neither too acidic nor too alkaline; high nutrient and organic matter present. Fertile, humus-rich soil is called loam, and contains about 40 percent silt, 20 percent clay, and 40 percent a combination of sand and organic matter. This ratio ensures good drainage, looseness, and retention of moisture and nutrients. To determine the make-up of your soil, place a cupful in a 1-litre jar, top up with water and shake well. The soil will settle in distinct layers of sand, silt and clay. The relative thickness of the layers indicates the proportion of each. If you find 1/3 or more is clay, you need to lighten the soil by adding sand, peat moss, compost, or a combination of thereof. The most accurate pH test is done using a pH soil testing kit. Since these are no longer in production and therefore unavailable, tasting the soil is a good test and is also harmless to people. If it tastes salty-sweet the soil is alkaline, and if it tastes sour or bitter it is acidic. Some crops do well in acidic soil, and others in alkaline, but most crops do best in neutral soil that is just a little bit acidic. To neutralize soil that is either too acidic or too alkaline, work in a generous amount of compost and fresh manure. Fertilizing is imperative for high-yield food production and to balance the nutrients in the soil for healthy plant growth. Below is a chart of different kinds and their contributions. Tilling the soil is important as it breaks up and buries matter that would otherwise compete with cultivated plants for space, water and nutrients. It also loosens the soil, kills eggs and larvae of many insect pests, and enriches the soil, all of which help produce stronger, more fruitful plants. A disadvantage to tilling is that it also kills worms and other insects that help aerate the soil continually, and it also dries out the rich earth that’s brought to open air. To prevent drying out, mulching is imperative. Bio-intensive agriculture requires double-digging the earth, a type of tilling that is labour-intensive but extremely thorough and effective in preparing soil for excellent crop production for years to come, producing 2 to 4 times more food and doubling soil fertility compared to using traditional, conventional row beds in the same amount of space. STEP 2: Thoroughly soak the area to be dug, preferably in 5 foot by 20 foot beds, then let it dry out for 2 days. STEP 3: Loosen the top 12 inches of soul with a spading fork and remove weeds. STEP 4: Water soil lightly and let rest for 1 day. 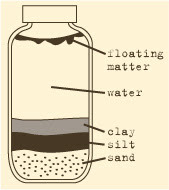 STEP 5: At this point, add a 1” layer of sand if soy is clayey, or clay if soil is sandy, and work into the loose soil. STEP 6: Add a 1” layer of compost and work into the soil. STEP 7: Water lightly and let rest for 1 day. STEP 8: Place a digging board (a large scrap piece of plywood works well) over soil, pulling back off the area that is the first trench, then keep moving back as you work each trench. STEP 9: Standing on the digging board, dig a 1-foot-wide by 1-foot-deep trench, saving most of that removed soil to start compost, and using some to make flat soil for growing seedlings. STEP 10: Loosen the soil at the bottom of that first trench (“double-dig”), to a further depth of 1 foot. If the soil is very hard and compacted, do at least 4 inches or as much as will loosen. STEP 11: Dig out the second 1-foot by 1-foot trench and move this soil over to fill the first trench, mixing the layers as little as possible. 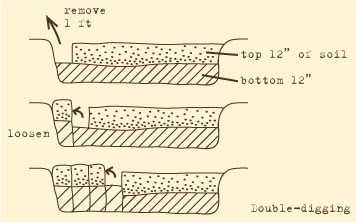 Do not turn the upper layer over when moving it from one trench to another – you are trying to keep the natural soil stratification intact. STEP 12: Loosen the soil at the bottom of that second trench (“double-dig”) to a depth of 1 more foot, or at least 4 inches. STEP 13: Continue until all trenches are dug. STEP 14: Level and shape the entire bed with a mounded top, filling the last trench with soil. STEP 15: Sprinkle the top of the bed with compost and whatever fertilizer and pH neutralizer required as per above. Do not rake or disturb the top of the soil at this point. STEP 16: Plant seeds or transplant seedlings. STEP 17: Cover earth with mulch (wood chips, shredded paper, scattered straw).